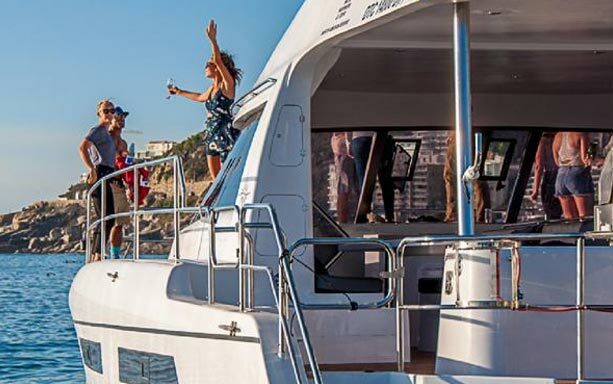 Is a State of the art 42" Power Catamaran built as Day Charter & Adventure Catamaran which as a maximum capacity of 65 passengers, however for a more comfortable and spacious environment, 50 guests is suggested. Maximum capacity of 65 pax. 50 pax is recommended. Cruise time and cruise course are dependent on weather conditions and at the discretion of the skipper. You and your guests safety will always be our primary priority. Sunglasses, hats, a jersey or windbreaker as well as non-deck marking shoes (eg trainers/deck shoes, no black soles) is recommended. On arrival you will be met by fully trained crew. Full crew and fuel. Exclusive use of the yacht. Cash bar onboard (Drinks and snacks – local beers, wines, sparkling wines and soft drinks. . Corkage fee for bringing own wines will apply. No other alcohol or soft drinks will be allowed onboard without prior written permission). Catering - Various menu options for the snacks & cocktail dishes / platters are available. Otherwise you are more than welcome to bring your own snacks. DJ / Entertainer - We have numerous DJs on our supplier list and are happy to facilitate that for you. Cape Town based singer/Entertainer details available on request.